French environment minister Nicolas Hulot has resigned live on national radio in a surprise move that will come as a blow to President Emmanuel Macron’s green credentials. 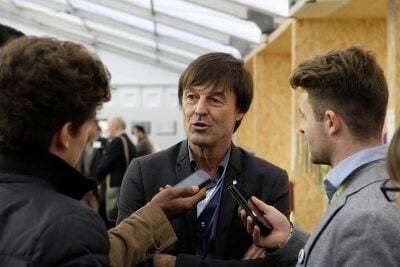 Hulot, a former broadcaster known in France for his wildlife and conservation documentaries, told France Inter that he had taken the decision to quit the government, saying he had felt alone in pushing for more ambitious climate policies and an energy transition to take place in France. “This is about being sincere with myself,” he said. Hulot said he had not told President Emmanuel Macron or Prime Minister Edouard Philippe about his intention to resign, which also came as a surprise to the two journalists interviewing him on the morning news programme. Hulot was made environment minister for the first time in May 2017 after deciding not to run as a presidential candidate a year earlier. As part of Macron’s government, he was forced to accept the implementation of the EU-Canada free trade agreement and a delay in reducing the share of nuclear power in France’s energy mix to 50 percent by 2025 — decisions to which he publicly objected. Rumours of Hulot’s imminent resignation were common during his time in office. Describing his “immense friendship” with Macron’s government, Hulot said that although he had no regrets in joining the government he had suffered from his time in office, increasingly accommodating himself with “small steps” at a time when “the planet is becoming a sauna and deserves that we change the way we think and operate”. “Am I up to the task? Who would be up to this task on their own? Where are my troops? Who is behind me?”, he asked. The environmentalist and former TV presenter admitted that he had been thinking about resigning throughout the summer but that it was the presence of hunting lobbyist Thierry Coste at a ministerial meeting to which he was not invited that prompted him to take the decision. “We have to talk about this because it’s a democratic issue to ask who holds the power and who governs in this country,” he told France Inter. Hulot said his time in office had been “an accumulation of disappointments”, citing France’s failure to move away from nuclear power. He said he felt like he had “a bit of influence but no power”. He stressed that the transition to a carbon-free world was a “collective responsibility” and that the dominating liberalism model had to be put into question if the world was to move to a green economy. “I hope that my resignation will lead to a profound introspection of our society on the reality of the world,” he said, pleading all sides not to use his resignation as political tool. Opposition politicians were also quick to respond to the announcement. The leader of the opposition les Republicans party Laurent Wauquiez, told RTL radio that he understood that Hulot felt he had been “betrayed” by Macron.